Oh, the dreaded cover letter. No one seems to agree on what’s it good for. Or if anyone even reads cover letters anymore. Yet, there’s something everybody admits: jobseekers hate writing them. That’s why we wrote The Complete Cover Letter Guide for you! All this negativity probably comes down to the fact that good cover letters require a bit of alchemy. Even when they’re written very well, their effects are often unpredictable. After all, cover letters seek to establish a relationship and people’s reactions are often difficult to foresee. This cover letter guide includes every piece of tangible advice anyone can give you. Still, as you’ll be reading the lines below, keep in mind that at the other end of your cover letter is a living person. Write your cover letter accordingly. 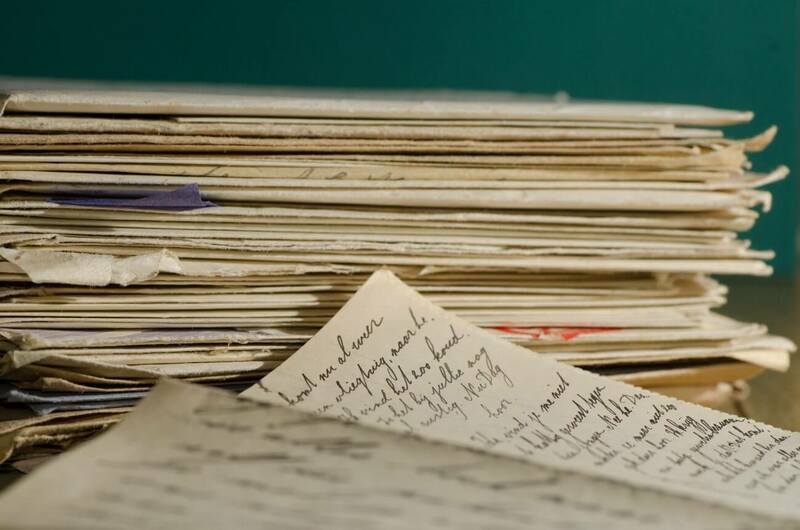 Why should you care about a cover letter? Let’s start with the bad news. If your resume doesn’t fit a desired profile, your cover letter won’t get read at all. For this reason, you want to make sure your resume is well-written first — here’s a great resume guide. What’s more, if your cover letter is weird, just plain bad or has a bad grammar, it can seriously damage your chances of getting a job. If this is not enough to discourage you from writing one, then know that one recent study found 63 percent of recruiters consider cover letters to be of low importance. Another study found just 18 percent of hiring managers think cover letters are an important part of an application. For all of its shortcomings, a cover letter gives you an upper hand in ways your resume doesn’t. It allows you to show off your writing skills, provide details that didn’t fit in on your resume, and demonstrate your passion. It’s an opportunity to distinguish yourself. One of the main reasons why companies are moving away from cover letters, is that candidates can’t write them well and hate writing them. 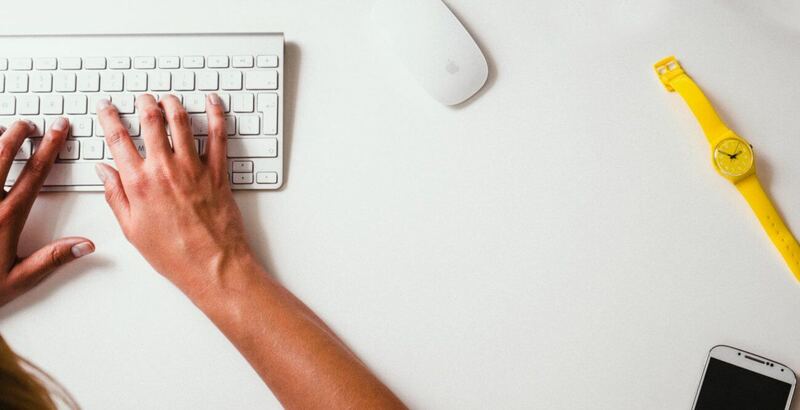 When some recruiters say “Don’t write a cover letter,” what they really mean to say is “Don’t write a bad one.” If you come up with a good cover letter, it’s sure to make a difference. Our cover letter guide will help you write a good one, keep reading. How do recruiters read cover letters? Firstly, remember the main point of sending a cover letter is to help recruiters decide if you’re the right fit for a position. For this reason, avoid generic write-ups at all costs. Most cover letters fall into this category and they don’t help recruiters decide in any way. On the other hand, what recruiters love to see is a short persuasive argument of why you fit the role and the company. Second, recruiters often look for inconsistencies. For instance, if your resume shows attention to detail but your cover letter is addressed to the wrong person, wrong company, and is replete with typos? It’s an inconsistency. You want to make sure the number of these inconsistencies is kept to a minimum. Before you begin writing, find out more about the company and the position you’re applying for. Spend some time on the company’s website, its executives’ Twitter feeds, and employee profiles on LinkedIn. Still, it’s never enough to simply read the job description. You want to know what challenges is the company facing and how you can help address them. Spend some time on the company’s website, its executives Twitter feeds, and employee profiles on LinkedIn. Finally, researching the company also helps you decide on the tone of your cover letter. The language you will use depends heavily on the company’s culture. If it’s a company like Kickresume, you can easily get away with more unusual approaches. If it’s a conservative institution, like a bank, you should probably keep it formal. When you’re browsing the web, what articles usually catch your attention? Those with great headlines, of course! The same applies to cover letter headlines. Start by paying attention to the headlines around you — especially in tabloids and websites like Buzzfeed. These are usually designed to stir up your interest and make it impossible not to click through. Notice how they use numbers, questions, interesting adjectives to promise the reader to learn something valuable. Finally, don’t forget to adjust your header to the company’s level of formality and put your headline in the subject of the email. When it comes to honorifics (i.e. Mr., Mrs., Ms.), everything depends on the company’s culture. If you’re applying to a corporate business, make sure to use a courtesy title before their name. If it’s a start-up or a company b with a more casual culture, don’t be afraid to ditch the title and use their first name. 3. Paragraph 1: Introduce yourself with a BANG! Compliment the company. Show that you know details about the company and you’re approaching it for a reason. Demonstrate appreciation for what the company does — not only will this compliment them, it will also provide them with insight as for who you are. Name a mutual acquaintance if you can. This is sometimes called a “magic bullet,” as it’s the one thing that will assure the hiring manager reads your cover letter until the end. Limit the introduction to 1-3 sentences. This isn’t the place to go into detail about what makes you an ideal candidate — save that for the second and third paragraphs. What did you do at a previous position that gave you relevant experience? How could this experience help the new company grow? 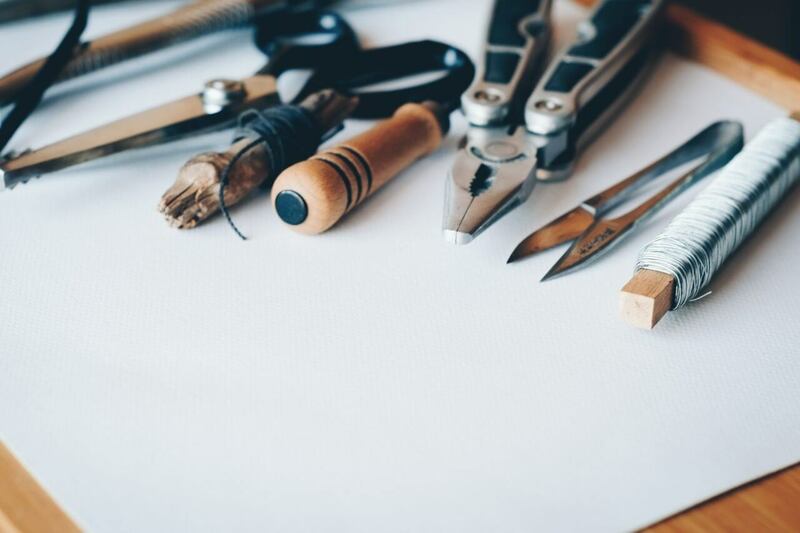 Which of the projects you have worked on would benefit their business? Which of your skills make you well-equipped for the position? 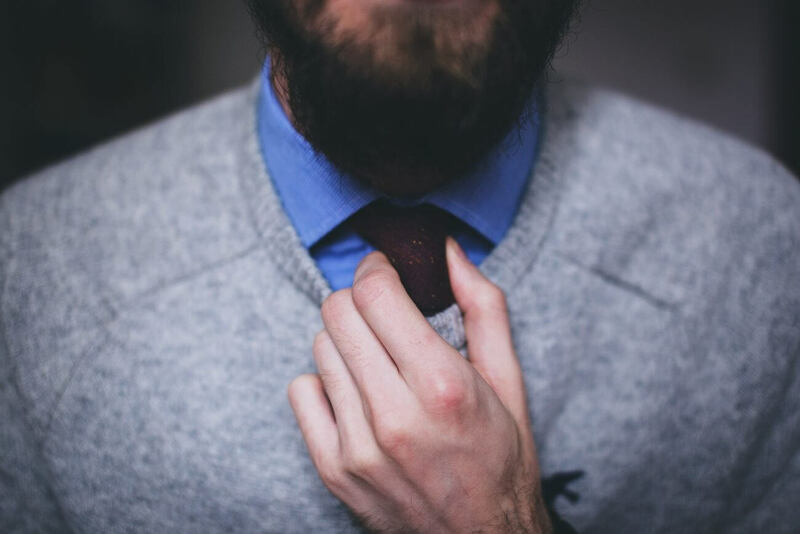 Does any of these skills give you an edge over other candidates? Put your most impressive accomplishments first. Don’t brag, be humble. You don’t want to come across as someone who lacks self-awareness. When in doubt, focus on your experience rather than yourself. You should be able to support each of your claims with previous accomplishments. Also, try to show that you know what the company does and that you’re familiar with some of the challenges it faces. Finally — and this applies to every other section of your cover letter — don’t simply repeat the same things you’ve already put on your resume. You want to go beyond that. 5. Paragraph 3: Why the company is a great fit for you. What excites you about the prospect of working at this company? How do the company goals and align with your own? What do you hope to gain and learn from working there? Convey enthusiasm but remain authentic in doing so. Don’t go overboard with flattery or say anything you don’t mean — it will probably come up again in later stages of the application process. You have your reasons for wanting to work there, explain what’s in it for you but remain professional and mature. You want to finish in a way that will make them remember you. In one or two sentences reiterate that your experience and enthusiasm make you a great candidate. This is to emphasise the two main points from the previous paragraphs. Always use a formal sign-off like “All the best,” or “Best regards.” Finish by typing out your full name. Don’t forget to include your phone number and email address in case the company decides to contact you first. Now the ball is in the recruiter’s court. By openly stating that you’ll be following up, you’ve created an opportunity to follow up yourself and remind them of your application. This how you politely put your foot in the door. 7. How do you send a cover letter? I can’t stress this enough — don’t send your cover letter as a document attached to your email. Put it inside the body of the email. The email is your cover letter! This way it won’t get ignored. What if you can’t submit a cover letter? Many companies nowadays use online application systems that discourage sending a cover letter. These systems often only allow for data to be entered into separate boxes. In these cases, try to work with the format you are given. You can also try to find someone online to whom you can send a brief follow-up email with a few points about your application. No matter the format, you are still expected to present your skills and convey enthusiasm about the job — follow the principles outlined above. The framework from our cover letter guide gives you a pretty strong foundation for writing a decent cover letter. Still, there are several tips you can follow to elevate your cover letter to the next level. Keep it short. Limit your cover letter to five hundred words. Recruiters and hiring managers are busy people who often have next to no time for reading long texts. For this reason, you want to say the most in the least amount of words possible. Don’t risk being funny. Poorly executed humour will hurt your chances rather than help. Being direct and dynamic is a much surer way to catch the recruiter’s attention than a number of any jokes. Show, don’t tell. Usually, there’s no point in saying you’re “a dependable hard-worker” or “a creative thinker.” Why should a potential employer believe such generic statements? Instead, offer an example of how these qualities helped you achieve something in the past. Never write the same letter twice. A cover letter is powerful only when it’s tailored to a specific job application. Remember the previous sections? You’ve made a great effort to research the company, its hiring managers, and you’ve written your cover letter accordingly. This is a process you need to repeat with every application. Facilitate reading. Take a look at how this article is written. It’s replete with short paragraphs, sentences typed in bold letters, bullet points, numbers, and block quotes. All of these serve to facilitate reading. Never send a letter that looks like an unreadable wall of text. Check for typos. This goes without saying but make 100% sure your cover letter is without typos. There’s no reason to believe you’re competent if you cannot even type without errors. Moreover, typos automatically reveal almost criminal carelessness on your part, since every text editor nowadays has a spellchecking feature. Don’t use any buzzwords. Your cover letter needs to be authentic and persuasive — buzzwords are neither. If anything, they simply give the impression of you being someone who’s just trying to fit a skewed idea of what an ideal corporate employee should be. If you’re unsure as for what words you should avoid using, check this infographic. Chapter 3: Cover letter examples and what you can learn from them. There are many different ways to write a great cover letter. It all depends on your own personality, the position you’re applying for, and the hiring manager’s preferences. If you follow cover letter guide above, you’ll end up with a cover letter that is invariably your own. Still, there’s a lot to learn from the different approaches the cover letters below chose to take. 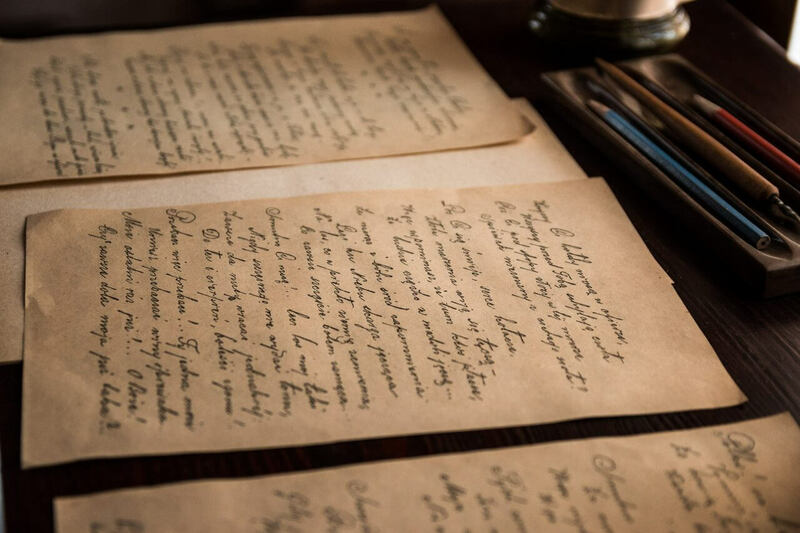 Harvard Business Review contributor David Silverman hailed the following as “The Best Cover Letter I Ever Received.” Obviously, he appreciates cover letters that go straight to the point and don’t waste his time with irrelevancies. You know the name of the person hiring. You know something about the job requirement. Someone personally referred you (which might include the previous points). Under those conditions you can help your application by doing some of the resume analysis for your potential new boss. This approach to a cover letter is based on the premise that cover letter should summarise rather than expand on the resume. 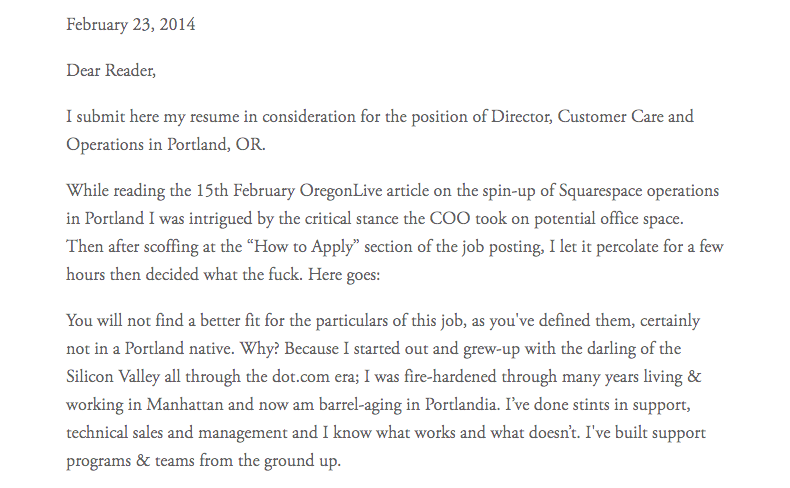 The COO of Squarespace called the following one of the best cover letters he ever received. Yet, if you read through it, you’re going to notice it goes against many of the recommendations outlined above. 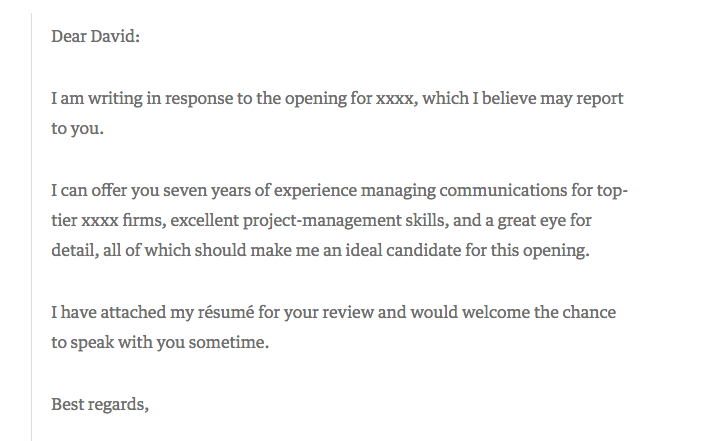 Cover letters like this one serve as an encouragement to get creative when you absolutely know you can. This requires a high degree of awareness of the company’s culture and the requirements for the position. At the same same time, it shows understanding of the job and gives captivating accounts of previous experience. One final thing. This cover letter guide wants to make sure your cover letter catches hiring managers’ attention. This doesn’t mean they’re scary or uncompromising people who like to exercise their power over unfortunate job candidates. On the contrary, try to see them as people who got the unfortunate job of having to go through hundreds of applications every day. The point of writing a great cover letter is to make their job easier for them. When you’ve finished writing your cover letter, reread it a few times. Try to imagine reading it as someone who knows nothing about you and wants to fill a job position. Does it help them decide? A good cover letter is about them, not you.